TRACKABILITY: identification and tracking of medical devices in order to track the life of the devices during the phases of the production chain: planning, manufacturing, quality control, installation and test. PROVISION MANAGEMENT: purchases are a critical aspect for the companies of this sector as they work tightly with providers and clients so to promptly satisfy the requests of a more and more competitive market. Microsoft Dynamics NAV can support the company by proposing and managing the appropriate actions in a short time thanks to its provisioning requests and purchasing prediction capabilities. SALES PLANNING: sales planning reduces delivery times, cuts the inventory and increases the efficiency in satisfying the client. 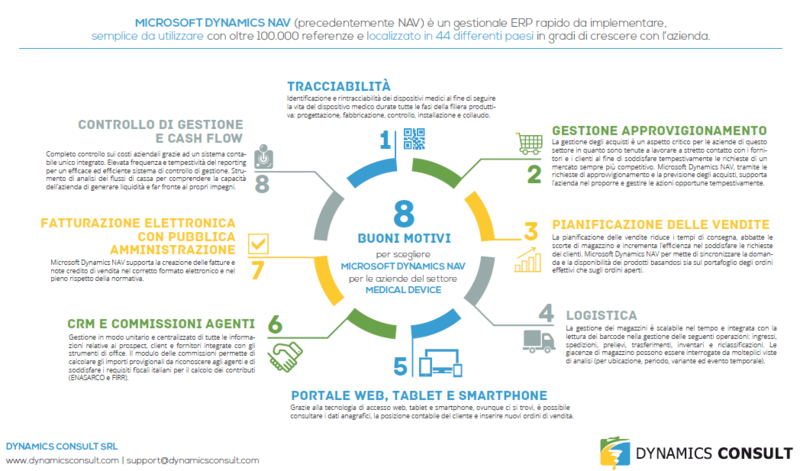 Microsoft Dynamics NAV allows to synchronize the demand and the availability of products according to effective orders and open orders. LOGISTICS: stock management is scalable over time and is integrated with barcode reading in the management of the following operations: entries, shipments, withdrawals, transfer, inventories and reclassification. Unsold stock can be queried by location, period, variant and temporal event. WEB PORTAL, TABLETS AND SMARTPHONES: thanks to the Web Access, you can use your tablet and smartphone from anywhere to access personal data, the client’s accounting situation and add new sales orders. CRM AND AGENTS COMMISSION: manage in a unitary and centralized fashion the information regarding prospects, clients and providers with the integration with MICROSOFT Office tools. The commissions module allows to calculate the costs of commissions to pay to agents and fulfil the Italian fiscal requirements for tax purposes (ENASARCO and FIRR). ELECTRONIC INVOICING WITH THE PUBLIC ADMINISTRATION: Microsoft Dynamics NAV can create invoices and sales credit notes in the proper electronic format and with a total compliance with the actual regulation. MANAGEMENT AND CASH FLOW CONTROL: take control of the company’s costs thanks to a unique integrated accounting system. Quick reports have an high frequency so to have an efficient and effective management control system. The cash flow analysis tool helps to understand the capability of the company to generate flows and face expenditures.